St Kilda is an inner suburb (neighbourhood) of the metropolitan area of Melbourne, Victoria, Australia, 6 km south-east of Melbourne's Central Business District. Head to Chadstone - The Fashion Capital and Acland Street, St Kildafor plenty of shopping. Relax by the water at St. Kilda Beach and Catani Gardens. Explore the numerous day-trip ideas around St Kilda: Dandenong Market (in Dandenong), Werribee (Werribee Open Range Zoo, B-24 Liberator Memorial Restoration Australia, & more) and McClelland Gallery & Sculpture Park (in Langwarrin). 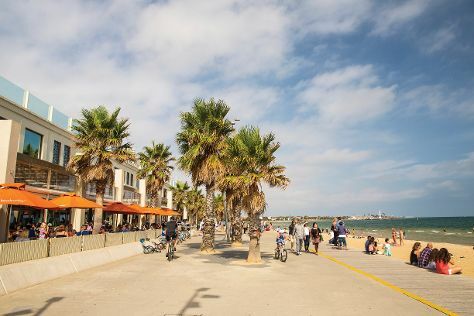 And it doesn't end there: kick back and relax at Brighton Beach, tour the pleasant surroundings at Albert Park, pause for some serene contemplation at St John's Anglican Church, and take an in-depth tour of Jewish Holocaust Centre. To find traveler tips, where to stay, reviews, and tourist information, read St Kilda day trip tool . Kuala Lumpur, Malaysia to St Kilda is an approximately 11.5-hour flight. You can also do a combination of bus and flight. The time zone difference moving from Malaysia Time (MYT) to Australian Eastern Standard Time (Victoria) (AEST) is 2 hours. Expect much colder temperatures when traveling from Kuala Lumpur in September; daily highs in St Kilda reach 19°C and lows reach 9°C. Wrap up your sightseeing by early afternoon on the 18th (Wed) to allow enough time to travel back home.